As the mercury drops, ice is beginning to form. This year we’ve been getting teased with cooler weather, but it just hasn’t stayed cold enough yet to form good ice. That will change soon and ice fishermen will begin to test and venture out on first ice. 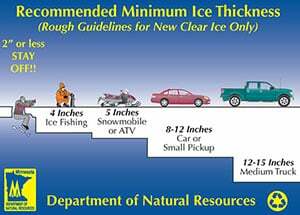 Ice is never 100 percent safe, but if you think and use proper safety precautions you can expect to stay topside and out of the water. When heading out on first ice, have the proper gear to check ice thickness as you venture out. You’ll also want to have the appropriate safety gear available in case of emergency. • Floating suit or life vest – cold water can leave you in shock and unable to get yourself out. • Ice chisel or spud bar to test ice conditions. • Measuring device to determine accurate ice thickness. • Ice picks. Keep these around your neck just in case you find yourself in the water. • Ice cleats for your boots to keep yourself upright. • Cell phone (in a waterproof case or bag) to call for help. • Floating throwable to assist someone else. • Rope to assist someone else. • A plan. Let someone know where you are going and when you plan to return. The most important item I carry is an ice chisel, which allows me to chisel holes and check ice thickness as I proceed. I also carry something that will give me an accurate ice-thickness reading. I have marked 1-inch increments on the handle of my ice scoop to check ice thickness in the holes I chop. I also use the chisel to strike the ice as I walk to make sure that I’m continuing on safe ice. A sharp chisel will chop through nearly 3 inches of ice with a solid blow. If my chisel doesn’t go through, then neither should I. Check this for yourself to see how deep your chisel penetrates into the ice on a solid strike. Determine what is safe for you, and never let others push you into unsafe conditions! Often a lake won’t freeze over at one time. Pay close attention to freeze lines where the lake froze at different times. This gets more difficult after snow cover, and you have to check as you go. You should be doing this anyway because not all ice is created equal. Ice conditions can deteriorate rapidly if warmer weather, rain, or heavy snow arrives during the first few weeks of fresh ice. Think. Be careful. And stay dry! Good luck fishing when ice arrives! Click HERE to check out more tips and tactics by Jason Revermann.